As I write this blog post, I am sitting at a table in Starbucks on a Wednesday afternoon. I have a cold pressed juice in front of me, a delicious blueberry scone in my belly, and LJ is 6 miles away playing at a friend’s house. And I’m not going to lie, it is downright glorious. I love my role as a work from home mom. I am so thankful I get to spend my days with LJ and also make a small income (read more about how I strive to balance these here). 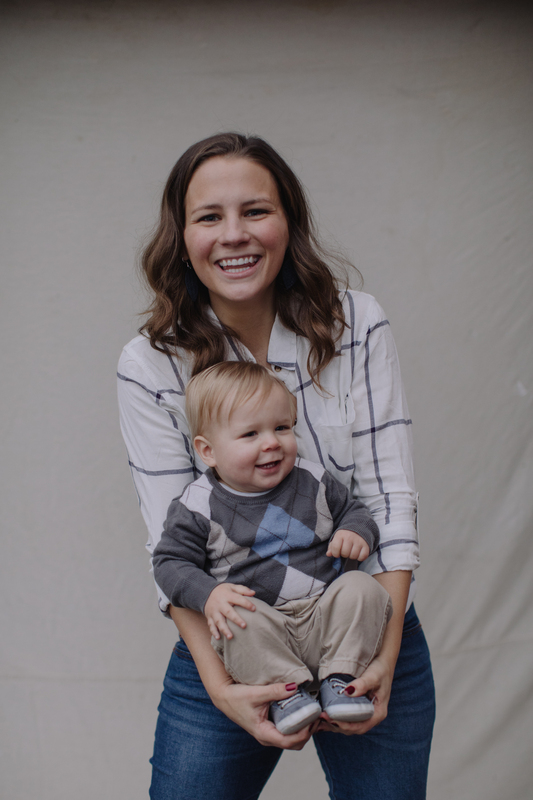 When I got pregnant with LJ, Justin and I decided that the best situation for our family would be for me to take a break from teaching to stay home and now almost two years after that initial decision, we are both extremely happy with how this has worked for us. That being said, I can’t be “on” as mom 24/7 and never take a break to recharge. I can’t give 100% of myself 100% of the time and not refill my own tank or I’m just running on empty and that helps no one. Self-care is an overused buzzword these days, but I do truly believe that it is critical for a healthy, balanced life. While I love my days at home, I know I need to have a little “me” time in order to be the best mom, wife, woman I can be. It’s been on my heart lately to write a post about the importance of taking care of yourself, so that’s where we’re headed today. And just for the record, self-care isn’t important for just moms. If you are single and work full time, you need to take care of yourself. If you are in grad school and working part time, you need to take care of yourself. If you are married, dating, divorced, no kids, seven kids, mid-20s, mid-60s, etc. you need to take care of yourself. This is important for everyone! I’m going to be specifically speaking to why it’s important for me as a wife and mom, but you just insert your own labels to make this fit you. It is important for you, regardless of where you are in life, to take care of yourself. Taking care of yourself isn’t selfish. In fact, taking a little time to recharge and refresh is actually selfless, because it allows you to be your best self when it comes to pouring into others. Before every plane ride, you are given the safety instruction that if the oxygen masks are activated, you need to take care of yourself first before helping someone else. You must make sure that you are functioning well enough to be able to adequately help someone else. If I spend my day in sweats and I don’t take a few minutes to wash my face or brush my teeth because I’m so busy taking care of my son, I feel pretty crummy about myself. If I spend every single nanosecond of LJ’s awake time personally engaging him in play, preparing him food, feeding him, and diapering him, and every nanosecond of naptime cleaning my house, preparing food for dinner, completing work for my job, doing laundry, etc, I feel completely depleted and exhausted by lunch. If I don’t get a little mental escape occasionally, my brain feels fried. If I don’t move my body and get a workout in at least 2-3x a week, I feel sluggish and low energy. And when I feel crummy, depleted, sluggish, and exhausted, my temper shortens, my frustration heightens, and my patience wanes. Sounds like a happy, fulfilling life, right? But. If I take a few minutes to quick wash my face, brush my teeth, and change into clean clothes (even if they’re just clean sweats), I feel refreshed. If I take just a few more minutes to swipe on some make-up, I feel put-together and prepared. If I allow LJ to play with his blocks independently while I finish my morning devotional nearby, I feel centered. If I carve 20 minutes out of naptime to read a book or paint my nails (or take a nap!) I feel recharged. If I take advantage of the YMCA childcare or complete one of my E&E workouts at home while LJ watches, I feel energized. And if I take a friend up on her offer to watch LJ for a couple hours one Wednesday afternoon so I can have some time to myself at a Starbucks, I feel rejuvenated. When I feel these things, I am kinder, more patient, flexible, and happier. Now. Crummy, depleted, sluggish, exhausted, short-tempered, frustrated, and impatient OR refreshed, put-together, prepared, centered, recharged, energized, rejuvenated, patient, kind, flexible, happy. Which version of Sarah do you think is at her best mom/wife/woman self? It’s not a very tough call is it? Sounds great. But I’m still a busy mom. HOW can I take care of myself? Find “mini” boosts. I wrote a whole blog post about small ways that I can get a little mental boost and recharge my batteries on days where I need a little lift but don’t have a ton of time. It doesn’t have to take an hour or cost tons of money. Most of my mini boosts take just a few minutes or can be done with LJ. These things are extra beneficial on days where Justin works a super long shift (sometimes up to 24 hours) and I have to fill both our roles at home. Communicate with your partner. If there is a week where Justin has several long shifts or we’ve had a lot going on and I need a little break, I communicate my needs with Justin. This might be “hey, I’ve had a crazy day today – can you take care of figuring out dinner or should we order pizza?” or it might be “this week is about to do me in – is there an afternoon or evening where you’ll be home with LJ so I can go to a coffee shop for an hour?” I thrive on a time to myself in a coffee shop to read a book, prepare a blog post, catch up on work for my job, etc. This does WONDERS for me. I always return happy, refreshed, and ready to jump back in to life and be the best mom and wife to my guys. It’s gotten to the point now where if we have a slow day at home, usually on a Sunday afternoon, Justin will ask me if I want to go have “me” time for a while without me even mentioning it. (Once it even involved me going to Panera and actually eating dinner uninterrupted by myself. Nirvana.) He has seen that this time makes a difference for me and I appreciate that he’s supportive. On the flip side, I support when he needs time away too. Just this past weekend, he got asked to join some friends for laser tag and I wholeheartedly supported this. He enjoys golf in the summer and we find days in our schedule where he can work it in so he can recharge and be his best self for us. It’s a give and take! But it doesn’t happen if you don’t communicate what you need. It’s not helpful if I am frustrated and snappy and just expect him to know what I need. Say BUH-BYE to any guilt. Mom guilt, man. What a crock. I have had to come to terms with the fact that self-care isn’t selfish. It doesn’t mean I’m not a good mom. It doesn’t mean I’m loving my child any less. I cannot, I repeat, can NOT give 100% of myself to my husband and child every moment of every day. It leaves nothing left. How can I function on nothing? Not one person would try to tell you it’s a good idea to keep driving another 150 miles once your gas light comes on, yet it seems that our culture often makes moms feel bad for taking time to take care of themselves. That is crazy! I know that when I take care of myself I am able to actually do a better job. I am a happier, more patient mom. I can be my best self, which is what I want to be. I want to give Justin and LJ my best and I’m at my best and brightest when I’m running on a full tank. And my tank is fullest when I’m making myself a priority too. What do you enjoy doing to take care of yourself? Now that I’m 16 weeks along with baby #2, I’ve begun to start thinking about how our living arrangement will soon change. We live in a 3 bedroom house and use the third bedroom as a guest room since we frequently host out of town guests. Right now I’m taking a “wait and see what works best for baby #2” approach. Perhaps he or she will need to stay in our bedroom longer (LJ transitioned to his crib at six weeks) or maybe we’ll figure out a way to have a combo guest room/nursery situation and just move baby back with us when we actually have guests. Or maybe we’ll transition LJ into the current guest room and move baby into his nursery. We’ll see what works best when the time comes! Since I’m not planning out a nursery this go-round, I thought it would be fun today to share a peek into LJ’s nursery and how we planned and prepared for his arrival (before we knew his gender). Our goal was to create a sweet and simple (and inexpensive) little bedroom for him. I don’t have an exact number, but when I calculated up approximately what our nursery cost us, it was around $400 (some things we already had and others, like our crib mattress, diaper pail, changing pad, etc, were gifted to us at our baby shower and not counted towards that total). Before I begin I want to clearly state: if you are all about trendy, matching furniture and decide to spend $2000 on a brand new crib/dresser/nightstand set from Pottery Barn, or you splurge on the gorgeous $1600 Tufted Wingback Upholstered Swivel Glider (and the matching $700 ottoman) from Restoration Hardware, OR you don’t have space or money for a nursery and keep your baby in a pack and play in your room (because when it really comes down to it, all babies need in a bedroom is a safe place to sleep), that’s your choice and you will get 0% judgement from me. Truly. You do you, mama. You know your preferences, you know your finances. The decision is for you and your partner to make. Justin and I agreed that babies cost a lot after they are born (clothes, diapers, wipes, food) and we didn’t want to spend tons of money on stuff before the baby was even here but we did want to create a space for our baby in his or her own room. For us personally, we chose to find ways to keep the nursery simple and inexpensive. That’s what worked best for us, and so I’m sharing how we made that happen. If you choose to do things differently, you do you. We re-used or re-purposed a lot of what we already had. When we registered for LJ, Justin and I both really loved a glider that we tested at Target. It was our style and the color went perfectly with our color scheme, but it was $400. We knew that there was a very small probability that it would be bought for us and we had other items in the pricier range that we needed to prioritize (like a stroller and car seat). So we said no to the glider and instead bought a $70 slipcover to go over an old, but still very comfy and functional, tan recliner that we inherited for free from Justin’s grandparents several years ago. It’s maybe not *exactly* the look we would have chosen, but for a $330 savings, we could absolutely live with it. 😉 I do want to say that while I’m so glad we could find an inexpensive alternative, I am thankful we had a comfortable chair in the nursery. We have spent a LOT of hours in this chair breastfeeding, rocking, reading books, comforting in the middle of the night, even sleeping on the nights LJ would.not.sleep. without being held – I strongly recommend a comfy place to sit in your baby’s room! We reused an old crate that Justin’s mom gave us several years ago. When we were first married, we needed a TV stand so she gave us this crate she had in storage. At the time all we did was sand the rough edges and stain it. We decided to use it as a combo bench/bookshelf/toy storage/nightstand in the nursery and I actually love how it looks there! My favorite re-vamped piece was this mid-century dresser we got off Craigslist a couple years ago for $30. We painted everything except the legs (I believe we used Slate Tile from Sherwin Williams and we just needed a quart of their Color to Go sample) and I spray painted the existing knobs gold and then roughed them up a little with sandpaper to look antiqued a bit. I absolutely love the way it turned out and the paint+spray paint supplies cost less than $15 total. Justin made this shelf for me a few years ago based on a picture I found on Pinterest. He used reclaimed wood and it was the perfect fit for above the changing table dresser! My sister is super creative and talented so she made most of our nursery artwork (the Peter Rabbit print was a farmer’s market find but the rest are my sister’s handiwork). I was able to snag a few pillows and fabric from a JoAnn’s that was going out of business so I made some simple pillowcases to spruce up the little bench area for a very low cost. There is SO. MUCH. INFORMATION. out there about baby gear. It’s overwhelming! Before registering, we read the latest version of Baby Bargains and this was one of our best decisions. This organization does use affiliate links but does not take money from the brands it reviews or participate in partnerships or sponsors or anything like that. I felt like we got good information from the book and it really helped Justin and I decide what items we wanted to splurge on (car seat, stroller) and what we could feel comfortable with a less expensive option (like a crib). We went with a simple Ikea crib for $100 (I couldn’t find our exact one but this one is similar) and love that we didn’t have to spend a ton of energy (or money) on the decision. Again, if you are all about a coordinated nursery and dream of a woodland/nautical/Parisian/etc room for your baby, that is totally your choice.! Since we re-purposed many items and wanted a gender-neutral space, it was easier for us to select individual items that fit a general vibe instead of buy themed items. We chose a gender-neutral color palette (white, gray, and shades of blue that didn’t feel like too “boy”) and selected fabrics, paint colors, and decorative items that worked within that palette. I found I preferred simple, whimsical items so I picked up little things here and there that fit that vibe. I mixed in plants for a splash of color and included some items from Justin and my childhood for a touch of nostalgia (on the triangle shelf sits his Winnie the Pooh and my bible from my dedication at church). I think think the result was a simple, sweet space that we were really pleased with. I’m really happy with how this space turned out and have really enjoyed spending time here over the past 15 months. Talking about all this nursery prep is sure getting me excited for another baby to snuggle in a few more months! What are your nursery must-haves? Today it’s time for one of my favorite posts each month: book review day! I’m reviewing three books this month even though only two are pictured because the third book I read while on vacation in Florida. Overall, I enjoyed all three books so I’m excited to dive on in to the reviews! You know the game “if you could have dinner with any five people, dead or alive, who would you choose?” Well this book is a story of that actually happening. Sabrina thinks she is going to her birthday dinner with her longtime friend but when she shows up, it turns out the rest of her “list” of people are there too even though some of them are dead (oh hi, Audrey Hepburn). 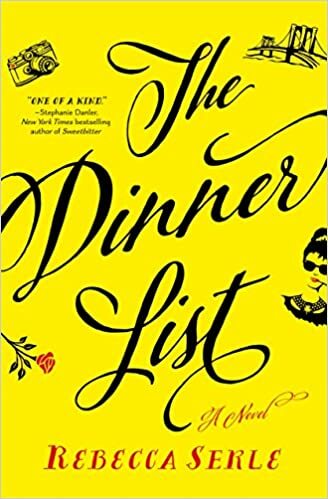 The plot jumps between the actual dinner and various times in Sabrina’s past that explain her connections to each person and why they are on her list. 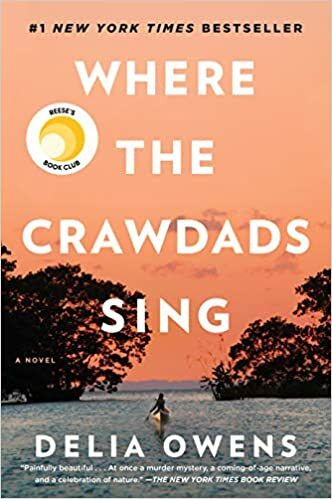 I was pretty intrigued by the premise and since this is the book I took on vacation to Florida, I flew through it in the hotel during LJ’s naps. There were sweet parts, surprising parts, sad parts, and downright shocking parts. While I did enjoy this book, to be honest, I got frustrated a few times due to some of the dynamics between the main characters. The more I thought about it though, I think that’s pretty indicative of life, right? Sometimes people are amazing, sometimes they are jerks. We all have our moments of triumph and weakness. This book gave me a lot to think about – it’s one that I can’t discuss too much more here for fear of spoilers, but I would love to discuss in person with someone who has read it because I have a lot of thoughts I’d like to work through! Since I finished The Dinner List so quickly and still had a lot of vacation downtime left, I borrowed this book from my friend Kaitlin’s bookshelf to read poolside while in Florida. Christopher is a bright 15-year-old boy and though the book never explicitly states this, it’s pretty obvious that he has autism. 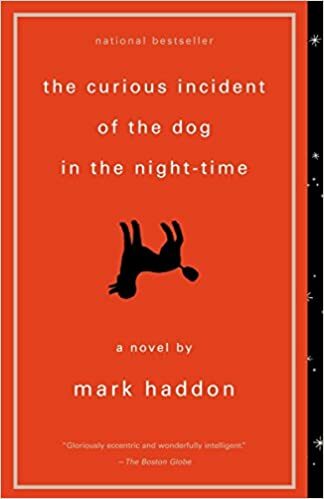 One night he is walking through his neighborhood and discovers that his neighbor’s dog Wellington has been killed in her yard. He decides to become a detective and figure out who killed Wellington and his search leads him to a trail of discoveries and adventures. I loved that the whole story was told through Christopher’s point of view, which I felt the author did very well, particularly with his experiences of sensory overload. I enjoyed getting to know Christopher and all his quirks and preferences. I also enjoyed the little touches the author gave, like numbering the chapters in prime numbers, because this was very much something Christopher would have done. That being said, I did find the book to be fairly predictable. There are a couple “twists” in the story but I saw them coming, though this is because I can read between the lines where Christopher takes things literally. (Perhaps the author meant for it to be this way, showing the difference between the way the mind of the reader works and the way Christopher’s logical train of thought works? Hmm…) I also got a little tired of all the unimportant/irrelevant details that Christopher gives and started to skim a lot in the second half of the book. Overall, I thought this was a good choice for an interesting, quirky, pretty easy read on vacation. Oh my gosh. This book! I had been on the library wait list for months and finally got my hands on a copy and it was worth the wait! Kya, known by locals as “The Marsh Girl,” has lived most of her life in solitude in the North Carolina marsh. She is remarkably in tune with nature and rarely interacts with the locals in the nearby town. One day, a murder occurs and suspicion is thrown to Kya. I don’t want to give away more of the plot so I’ll just say that while it took me a chapter or two to really get into the story, once I did I was absolutely swept away. This book is just beautiful and incredibly well written, a captivating tale of love, heartbreak, prejudice, and survival. The descriptions of the marsh life are vivid and enchanting. And the characters are expertly crafted and human, with flaws, mistakes, regrets. And Kya’s strength and resiliency despite the rejections of her life is remarkable and makes her endearing to the reader. As the book works its way towards solving the murder, my heart was pounding and I was just flying through chapters. I highly recommend this one! I’ve got a lot of other books that just came off the library wait list so I’m extra excited for what’s coming up in March. What have you been loving reading lately? Once again I’m joining Erika and Shay‘s monthly link-up Let’s Look and this month’s topic is The People in My Family. This guy right here is the rock of our family. He is the calm to my crazy, the laid-back to my Type-A, the fun to my focused. He is energetic and easy-going. He makes me laugh daily and challenges me to be a better version of myself. He is far from perfect but I am so very thankful every. single. day. to have him in my life. Justin and I met my senior year of college and we started dating in August 2011. I knew pretty early on in our relationship that he was the guy for me. We got engaged in July 2012 and he moved two hours away for school in August. We made the long-distance engagement work and got married in June 2013. This boy has only been in my life for 15 months but he has captured my heart forever. LJ’s little personality is just the right mix of sweet and spunky. We love his sly smirks when he knows he’s doing something sneaky that he shouldn’t, we adore his sweet hugs when he sees us after any length of time apart. His little coos, his sweet claps, his over-the-top affection for his fur siblings. . . this kid just makes me smile! Parenting is not easy and there have been days where I can. not. wait. for bedtime to roll around but I picture life without him anymore. He is just such a light in my life and I love him so! And of course, soon there will be one more person joining our family! I am also lucky enough to have grown up in a really supportive, loving family. I have two amazing parents who have been married 31 years and have been such influential role models in my life. I’m the oldest of three siblings (one brother, two sisters) and I’m thankful that we all get along and enjoy spending time with one another. Not a week goes by without a phone call from my mom or one of my sisters (sometimes all three) and I love that we want to be part of one another’s lives. My in-laws all live in Virginia but I was lucky enough to get to spend lots of time getting to know them in the early days of Justin and my relationship when I lived out there. We visit several times each year and vacation annually together (always a great time!) Most of us have also been in a Fantasy Football league together which was a fun way to stay connected despite physical distance. I’m so thankful to have a second family who has welcomed me in with open arms! And of course, these two goobers are an important part of my family. I love my sweet pups!